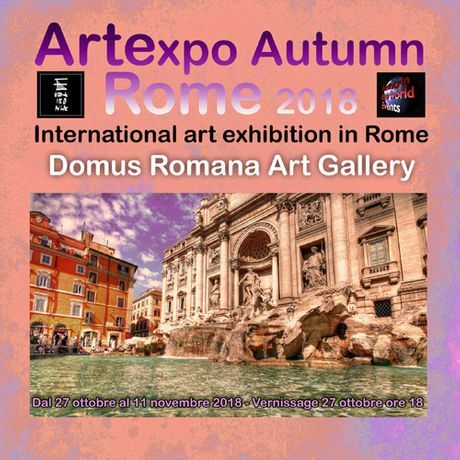 It opens on Saturday, October 27th at 6 p.m. the international art exhibition in Rome "Artexpo Autumn Rome 2018" at the prestigious location of Domus Romana Art Gallery https://www.domus-romana.it Via Quattro Fontane, 113 00184 Rome situated in one of the most beautiful areas in Rome between Piazza di Spagna and Fontana di Trevi, in Rome's historic center. During the vernissage there will be an unmissable show of the ECHOES Company, a dance theater performance entitled "Fase R.E.M. ", with original choreographies by Giuliana Maglia and with: Tiziana Cardella, Laura Di Biagio, Matteo Gentiluomo, Giuliana Maglia, Giusy Pizzimenti . It is a set of dreamlike images evocative of an altered "reality not reality", in which we move in time and space, where everything is exaggerated but still possible. A succession of figures drawn from dreams without following a "story line", because a dreaming mind makes flights of fancy and is not always entirely explainable.